Varroa mites may be mighty small – about the size of the head of a pin – but the parasites are a primary cause of colony collapse disorder, a large problem for honey bee populations worldwide. A study published in the Proceedings of the National Academy of Sciences today debunks the long-held belief that the mites feed on “bee blood” – AKA hemolymph. NC State entomologist Allen Cohen, a co-author on the PNAS paper, wasn’t surprised by the study’s results. For years, he’s contended that the mites’ digestive system and the content of their excrement point to another, denser food source. Samuel Ramsey and his University of Maryland colleagues found that Cohen was right. Conducting the research as part of his doctoral studies under Professor Dennis vanEngelsdorp, Ramsey determined that instead of drinking hemolymph, the mites consume the bees’ fat body, an organ that stores and uses nutrients as they are needed. That finding is significant, the researchers say, because it explains why some previous methods of controlling varroa mites have failed. Not only that, it also sheds light that could lead to more effective measures for protecting honey bee health. 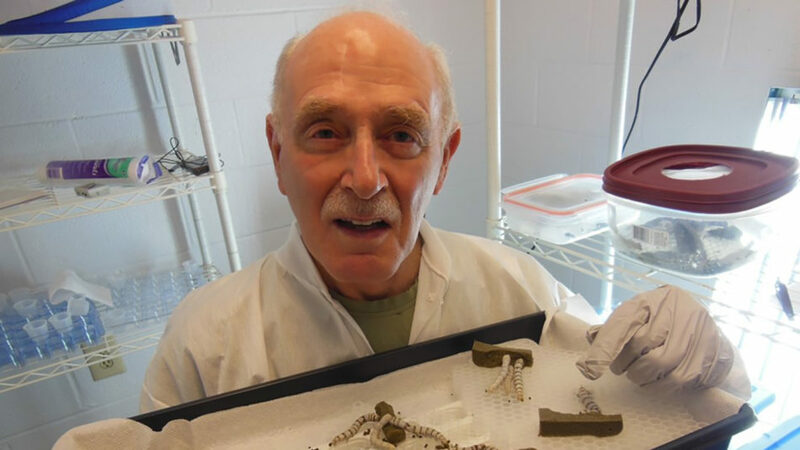 Cohen has been studying insects and arachnids for more than 40 years, first for the U.S. Department of Agriculture and then as a researcher in NC State’s Department of Entomology and Plant Pathology. Cohen, who’s with the department’s Insect Rearing Education and Research Lab, has literally written the book on the science and technology related to artificial insect diets. Such diets are used in insectaries where arthropods are reared en masse for use in research as well as in pest management techniques such as biological control, which involves releasing large populations of natural predators to limit the damage insects cause to human, animal and plant health. Cohen’s work with scores of arthropod species led him to believe that insect predators use powerful enzymes that they pump into their prey with their straw-like mouthparts to turn the pests’ insides into mush, then extract and digest the slurry. Cohen says he got the idea after his jaw was broken in a fight. With his jaw sewn shut, he couldn’t eat solid food, so instead he sipped liquids – including milkshakes and eggnog — through a straw. Despite the high-calorie drinks, he lost weight and always felt hungry. The idea that predatory insects use extra-oral digestion led Cohen to publish a paper in the Annual Review of Entomology in 1995. Around the same time, he co-authored an article with the late E.H. Erickson on white spots that showed up in beehives infested with varroa mites. They determined that the spots were the mites’ excrement, and Cohen believed that the spots were too thick and pasty to be the result of consuming hemolymph. The parasitic mite Varroa destructor is the greatest single driver of the global honey bee health decline. Better understanding of the association of this parasite and its host is critical to developing sustainable management practices. Our work shows that this parasite is not consuming hemolymph, as has been the accepted view, but damages host bees by consuming fat body, a tissue roughly analogous to the mammalian liver. Both hemolymph and fat body in honey bees were marked with fluorescent biostains. The fluorescence profile in the guts of mites allowed to feed on these bees was very different from that of the hemolymph of the host bee but consistently matched the fluorescence profile unique to the fat body. Via transmission electron microscopy, we observed externally digested fat body tissue in the wounds of parasitized bees. Mites in their reproductive phase were then fed a diet composed of one or both tissues. Mites fed hemolymph showed fitness metrics no different from the starved control. Mites fed fat body survived longer and produced more eggs than those fed hemolymph, suggesting that fat body is integral to their diet when feeding on brood as well. Collectively, these findings strongly suggest that Varroa is exploiting the fat body as their primary source of sustenance: a tissue integral to proper immune function, pesticide detoxification, overwinter survival, and several other essential processes in healthy bees. These findings underscore a need to revisit our understanding of this parasite and its impacts, both direct and indirect, on honey bee health. • Does Bee Diversity Change How Pollinators Behave in Blueberries?